No rest for the wicked and Fed is already back in action on the hardcourts, defeating Vasek Pospisil 7-6(4) 5-7 6-2 in the 2nd round of the Western & Southern Open in Cincinnati. Not the most convincing match from the Swiss but he got the job done and can hopefully pick up some form which seems to have left him after the early stages of the Roger's Cup. It's slightly annoying he's played another 3 setter after going the distance twice last week vs Ferrer and Cilic and isn't ideal considering he admitted feeling tired in his post Tsonga loss press conference last Sunday. Roger won the toss, elected to serve and was soon on the scoreboard with a confident love hold. Pospisil is known for having a fairly big serve but he looked shaky in the early stages, firing down a couple of double faults and Roger had a chance to break at 2-1 but failed to convert. 2 more break points came his way in Pospisil's next service game but again the Canadian held. The tables then turned and Pospisil had his own chance to break at 3 all but he too couldn't take advantage and Fed held for 4-3. At 5-5, Fed again found himself in a bit of a hole down 0-30 but he stood firm to hold before Pospisil held to force the tie break. The breaker started well for Fed as he got up an early mini break, handed it back but played a very well anticipated net point to regain the advantage before closing it out 7 points to 4. After a closely fought first set I expected Pospisil to fade but it was Roger who slacked off. As usual he was holding with ease but failed to make any impression on the Pospisil serve. There was only one half chance at 0-30 in the 7th game but other than that it was a fruitless set and the returning was less than stellar. At 5-6 I expected Roger to continue with the trend of holding his own serve easily but he got himself in trouble at 0-30 and Pospisil broke to take the set 7-5. Bit of a steal as he'd not really done a whole lot either but he was the first to 6 games and then took full advantage when he needed to. Into the third set and the stat of the day was that Roger hadn't broken an opponents serve in over 25 return game, he'd also failed to hit a single backhand winner in 2 matches which is probably the first time that has happened. After expecting Pospisil to fade after the losing the 1st set I had no idea what he had in store after winning the 2nd; fortunately he ran out of gas as Fed broke him early to lead 3-1 before claiming the all important insurance break to lead 5-1. Normal service resumed. The Canadian managed to avoid the bakery products but Fed closed it out 6-2 with a sweet serve and volley play on match point to record his 300th match win at Masters 1000 level. Tough match but not much to really learn as getting the win was the most important thing. As we saw with Tsonga, Dimitrov and Lopez, playing well in back to back Masters 1000 tournaments is extremely difficult. Although Fed didn't play well, his name is still in the draw, whilst those 3 guys are all checking out of their hotel rooms. Fed's level wasn't special in the slightest, but if the adage you're only as good as your second serve is true then he's pretty damn good as he won 81% of points behind it. Which was more than his first serve at 75%. Without really doing anything spectacular he basically just waited till Pospisil's level dropped and took full advantage. The Canadian had a tough 3 set win over Stepanek a day earlier and also played doubles too so he clearly wasn't the freshest. Just good enough is probably the best way to describe it from Fed's point of view. From the last couple of matches it looks like Roger is still struggling for timing and rhythm from the baseline which is a bit of a concern. It's still early in the hard court swing but he looked good early in Toronto but has since faded in recent matches. Not quite trusting his groundstrokes appears to be the main problem and his backhand has been a source of many unforced errors. Hard to really figure out why but it's bound to be a combination of things. The only other real negative is the time on court, another 3 setter isn't ideal considering Fed said he was tired after the gruelling schedule in Toronto where he played 4 night matches on the bounce. I feel like he could have done with getting this one done in straights because he will be playing every single day from now on if he were to make the final. Guess we'll see, he might just get a second wind when he needs it. Next up is Clownfils who comfortably defeated the Royal Bank of Agut 6-4 6-1. Some unfinished business here for Fed as Monfils won their last encounter in Shanghai when Fed was at a very low point in the season. Tough to call this one as Monfils is a mercurial talent, one minute he can be unstoppable, the next he looks like he'd rather be break dancing on a street in Paris. Some days he hits the ball huge, other's he just pushes it in play. I think a lot depends on which Monfils shows up on the day as to whether he can win. Interestingly Monfils has won 2 of the last 3 encounters, and he's one of the few players who can say they beat Federer from being match point down. He clearly knows how to get the job done vs Fed but whether he can execute it is debatable. One thing you know for certain when playing Monfils is you're not going to be facing a set game plan, it's just whatever shot he decides to hit the second before he makes contact with the ball. In Fed's victories over Gael he's always done a good job of moving him around the court so I guess that's something he will look to do tonight. Clean up any short balls too and try finish at the net. I'll pick Fed but he'll need to play better off the ground than he did vs. Pospisil. He just needs to find a base level and never dip below it, if he can make Monfils have to earn every point plus stick with his net attacking intent I can't really see the Frenchman getting it done. Fed in two: 7-6 6-2. Allez! Poor quality match but Fed get's the W which was definitely key. Hopefully a stepping stone into the tournament. I think he is still struggling with his timing, but definitely better than in the Toronto final. Or any of the Toronto matches really. And his serving was better. Partly because Pops just couldn’t seem to do anything with Roger’s second serve, but that was because how well, varied, and with a ton of ‘English’ on it, Roger was hitting it. Roger may be still a little tired, but overall looked better to me than at almost any point in Toronto. With all the complaints about Roger’s ‘nights only schedule’ (I too thought it was unfair to have NO day matches before the final), Paul Annacone made an interesting point about Roger’s BH day vs. night. He said, IIRC, that Roger feels free-er to hit his BH, esp, top spin DTL with more pace at NIGHT just because the ball is less likely to fly on him. Hmmm.. Interesting comments from Paul Annacone. I think his top spin BH (both crosscourt and DTL) has become weaker with the new racquet because i think the RF97 is bit unwieldy compared to the PS90. However, the BH slice, serve and volleying are much much better. The depth on the slice is incredible. It mostly lands close to the baseline. I would like to know the swing weight of RF97 Vs PS90. The higher the swing weight the more it gets unwieldy and the more difficult it is to swing fast and put more spin weight into the shot. Also i would like to know the top spin revolutions per minute (ball rpm) of both FH and BH of Rogers with the RF97 compared to the PS90. There’s a YouTube review of the new racquet which mentions swing weight. Not sure of the link but I think Jonathan – was it you? – has posted it before. I think it’s fairly obvious the new racquet has helped the backhand significantly. If one shot has suffered it is the forehand. Roger seems played bit confident on ground strokes after the early break in third set. Hope he builds on it…. 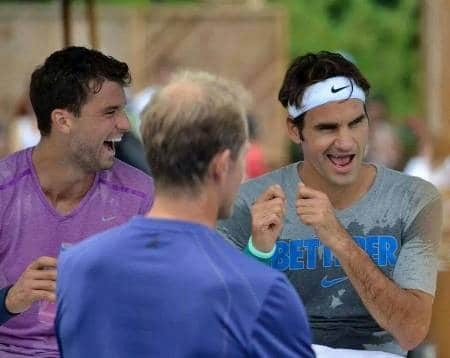 in Other note, Fed, Dimi and Edberg pic, is that from Toronto? It seems all three in same shirt where I happened to watch them Sunday before last week. My son saw him live on that day practicing and now he calls as Magic Federer, and want to go see again…He is 3.5 Years Old..
Didn’t realize you had been to Toronto live as well! Hey Jon, when you retire, don’t you want to hold a competition for your bloggers?? Couldn’t watch it, so perceptions come from stats only – but those UFEs are still a big concern. Hope things start to click for him. Glad to read Hawkeye’s comment above that he sees improvement from Toronto. Roger played great in the 3rd set. Not sure how much of it relates to the drop in Pospisil’s level in the third. Too many UFEs from Roger still. Hope he cleans up by USO. Yeah string of errors but he played way sharper vs Monfils. But you are right about that he did good job for the 2nd serve points. Fed himself said too to Gimelstob on Tennis Channel interview, “happy for the stats because you are only as good as second serve”. Hope he will be Betterer and improve his level of play sooner rather than later. You know what Fed Friends, a win is a win and of late many of these matches have been tight 3 setters for all. No easy games here, tough schedule, tough conditions etc. But he finds a way and given the ones who hv fallen, that is good enough because he is not checking out yet! What concerns me most is the energy levels with so many tight matches. 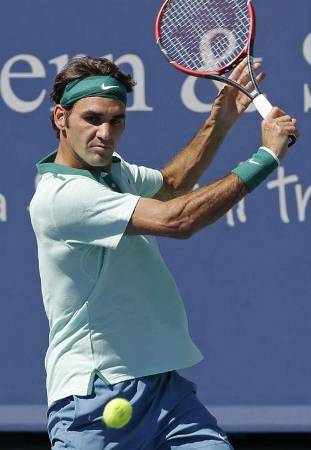 Hoping he is sufficiently rested for Monfils, and hoping for a quicker win for Roger tonight! What a game between Muzza and Isner! Huge points! Great drama! Muzza saving 2 MP’s! Let’s hope for an energy efficient match for him tonight! Yeah another tough 3 setter vs Monfils. He has played a ton of matches lately. Having now seen some highlights, it looked to me as though Fed got caught wrong-footed more than once, which doesn’t often happen with him. Maybe it’s just not being familiar with Pospisil’s game….. hope so, he’s been moving so well. And on the positive side the movement on the shot they chose for “hot shot”, the one where he passed to get to set point, he’s just flying – gorgeous. Moved much better vs Monfils. Thanks for the post Jonathan 🙂 . I didn’t see the match but I hope after reading your post that Federer raise his level and beats Clownfils. Wow 300 wins at 1000 level. Another fantastic record. But hot on his heals is Nadal as he 19 match wins also in winning 300 and I think Djokovic is third with about 80ish for him to get there. But the great Roger Federer is the first do it. Anyway I hope he has another good tournament and can go deep and give him enough wins confidence to do well at the US open. I really hope he can at least win 1 masters 1000 event this year as he is making the finals but falling at the last hurdle for whatever reasonas ththehe 3 losses where he could of won is a bit annoying and Federer seriously needs to start winning more finals. Cpme on Roger you can do it !!!!!!!! I think Cincy has already been a success, winning 2 matches is decent prep. Win or lose Quarters I think he has a good USO. Hey guys, anyone nervous for Roger vs Monfils?? I am. Apparently players always play their best tennis against Roger. Losing to pretty much everyone, but against Roger they suddenly remember that they are damn good players. Ofcourse Monfils already is one good player, almost beats the top 4 regularly. Come on Roger 🙂 Make it happen. Anyway Novak is out. Looked honestly disinterested to me. Maybe already thinking about USO? Robredo played sooo well. Deserved to win. Muzza also hanging tough and winning. Good for him. Stan the Man played his 2nd and 3rd set against Cilic like he played the 3rd set against Roger at MC. Every point he made was like gold. Everything worked. Very though proposition for FED. Let’s hope Gael blows the match, an easy win would be just the perfect rest Roger needs to go further! And god I love the pic with Dimitrov and Edberg, Thanks Jonathan, great gift !!!! Monfils is just another average playing from the French doping academy. Anyone remember his gamesmanship tactics at…Shanghai…was it, where he was tying his shoelaces all the time, and taking long breaks serving, and even receiving? It’s time for some revenge. I absolutely hate that guy. Yeah, but what a break-dancer! FYI Monfils is one of Federer’s favourite player on tour, he really likes him and uses his character when he plays tennis on the play station. And beyond the fact that Monfils might be a little undecided in life, he is an amazingly talented, skilled and athletic player… One of the best. Plus one of the most polite and kind on the tour. Not only but for the love of the game, he deserves respect!!! 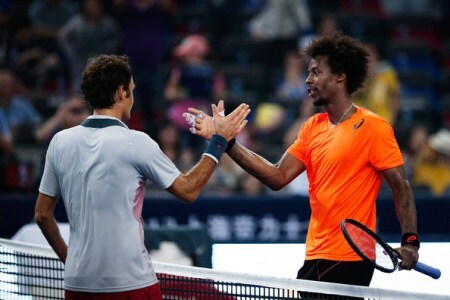 Yeah Fed and Monfils get on well, you can see at their handshake, always friendly. Monfils is an entertainer, always good to watch. But a bit of a wasted talent. Can’t remember Shanghai gamesmanship. But I know he will act up injuries then chase down a ball at light speed. Guess that’s just him. Looks like Djokovic is going through some down-time in his cycle. Losing to Robredo – what! As for Roger – he could do with some of Stan’s groundstrokes these days – after Stan’s demolition of Cilic. Fantastic backhand, passing shots that don’t miss. Funny, but Roger’s groundies used to be way better than Stan’s – for 11 straight matches in fact. But that was the past, and the past is another country. There was so much pressure on Djokovic to win Wimbledon, he gave it his all to win there. Probably a bit drained. Grand Slam is a whole other story, I’m sure he’s not going to lose early in New York. Haha did he? Comedy. Could be a Fedredo inside job. I agree with Sridhar though, he’ll be tough to beat over 5 sets in NY. Yes, Robredo took a mto at 5-4 2nd set right when Novak would be serving to stay in the match (so hope I saw it well…. ).